The journey to becoming a vegetarian can be a hard one but very rewarding. Knowing what to do is always a must when it comes to a lifestyle change. You can make small changes that can do wonders for your health. With any lifestyle change, there are times that it can be difficult but having and knowing some tips can help get you through the harder times. Here are some tips that helped me when I decided to have a lifestyle change to becoming vegetarian for health reasons. Changing your lifestyle to being vegetarian can be a difficult task. One of the things that you have to remember is to do it for the right reasons. This will help you stay on track. Being vegetarian can become stressful and hard to do if your mind is under stress. You have to want it and love it so that it does not become like a chore. One of the mistakes that people make when switching to vegetarianism is that they do it all at once. This can cause problems for them because they get overwhelmed and feel like giving up. The best way is to move on your own pace. Make sure that you are transitioning at your own speed. Do not pressure yourself too much. You have to keep in mind that your body needs different nutrients. Learning about the different food groups that your body needs will help you stay healthy. You will find that substituting different vegetarian foods for needed nutrients is easy and that the only thing needed is having knowledge of which ones are great substitutes for nutrients. You may already eat food that is loaded with vegetables. Vegetables are already a part of your diet and the only thing you need to do is to realize this and add more of it and slowly take away the meat. There are plenty of different substitutes for meats now. You can find them at stores around you. The only thing that you need to do is to know what they are and where they are located. There are vegetable substitutes like vegetarian burgers, sausages, and hotdogs. This will help you with not feeling like you are depriving yourself. Having different recipes to cook will spice things up. By having different recipes, you are making sure that you do not get tired of your lifestyle choice. Besides the normal vegetarian menu that you have decided on cooking for yourself, one trick that I have is to try a new recipe every week. This keeps things more interesting when it comes to eating. You will be able to add the good recipes that you find to your taste into your recipe collection. Using different spices can help you stay on course with your lifestyle change. Becoming vegetarian does not have to be bland or boring. Having and using different spices adds so much more excitement to your life as a vegetarian. Exploring your local shops and supermarkets will help you discover new types of vegetarian foods that you can cook and eat. Walk through the produce department and find a new fruit for vegetable that you would like to cook with. This will give you more choices for your diet and nutrients supplementation. The more choices that you have, the better it is for you so that you would not feel like you are eating the same exact things over and over again. You do not have to be stuck to eating the same type of food from one country. Every country has a different set of foods that are vegetarian friendly. This gives you more recipes to your collection. There are many people out there that voice out their opinions and comments about everything. This kind of thing is expected. Do not get put off by what others say though. Most of the time these people are the ones that do not know much about being a vegetarian. You do not have to go through this lifestyle change alone. There are other people that are choosing the same lifestyle. This may give you the support you need to get through your lifestyle choice. Find a friend to join the journey and be healthy together. You may think that what you are eating is a vegetarian meal but sometimes there are things added that makes the meal not a vegetarian meal at all. Always check the labels of the foods you are going to eat. Some foods sneak in ingredients that are parts of animals. Check the ingredients of the food before making a purchase at the grocery store. 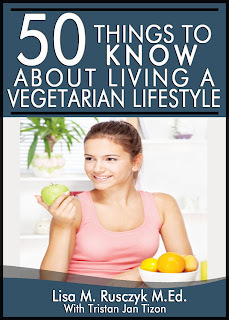 To read all 50 tips view 50 Things to Know To Live a Vegetarian Lifestyle eBook. A great gift for a friend! I ENCOURAGE YOU to borrow the book for free from the Kindle Lending Library for Amazon Prime Members. If you would like to share these tips please email me at lbrennec@gmail.com. Lisa Rusczyk is the founder of Charlie The Cavalier (a blog about Charlie her dog, and her friends, family and home) and founder of 50ThingsToKnow.com. Lisa is a Doctoral student in Educational Leadership who happened to start writing her first book 50 Things to Know Before Having a Baby after her little girl was born. Her book sold over 1,000 copies in the first year. Today, she has over 10 books and helps others self-publish. Further, she shares this information with the public via this blog, Facebook, YouTube, Pinterest, Twitter, and recently on a local television station. Lisa knows that like her, there are a lot of people who would like concise information on a topic in a digital location. She’s known for her simple and effective tips. Proudly powered by WordPress Theme: Ever After by Automattic.